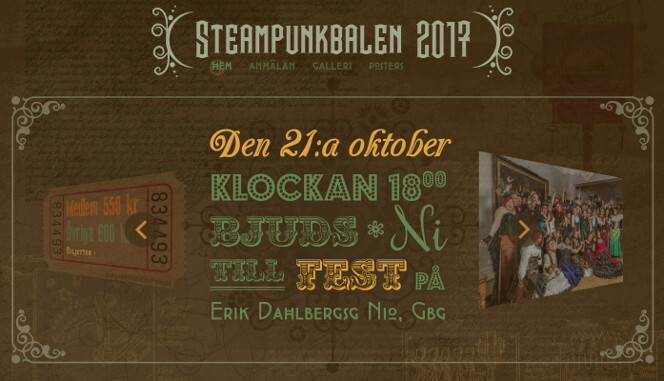 The Steampunk Ball is a recurring event hosted at a beautiful old hall by members of Steampunk Götheborg. It was decided that the 2017 instalment needed a new site which presented the most important information up front, and which used photos from previous balls to set the atmosphere and provide inspiration to new guests. 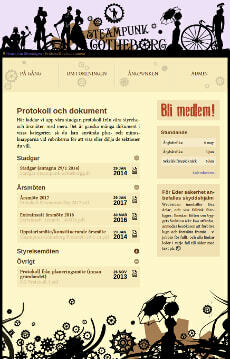 My contribution to the project was a fully responsive design, HTML mockup and style/design guide. The site is quite heavily optimised for speed and features modern CSS techniques aplenty. This project had me really practice my skills at progressive enhancement, as it needed graceful fallbacks for IE8, and preferably even older beasts! 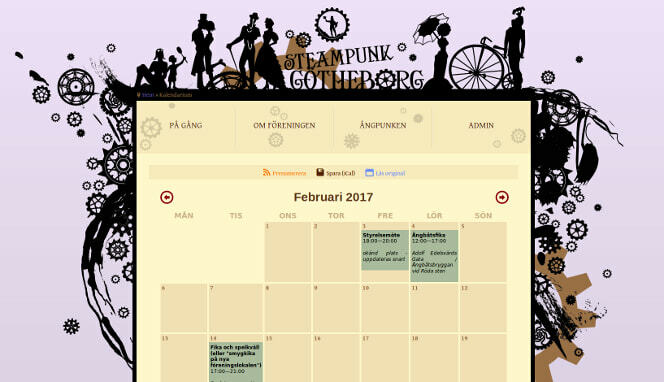 When Gothenburg's first steampunk society (and youngest SF club) was founded, my involvement in the Alingsås Steampunk Convention made it natural that I be in charge of the society's graphics and web presence. The site is responsive and features a customised WordPress backend, member-only areas and a simple Google calendar integration. Since I am responsible for ongoing maintenance, occasional upgrades and redesigns will probably happen without warning. On the print side of things, I've made two-tone contact cards, flyers and posters for events and—something of a first—a vector design cut into a big piece of brass, which was made into a parade sign. What do you do when your child suddenly goes missing and the other parent is the suspect? It turns out you panic for a year, and then ask everyone for help. 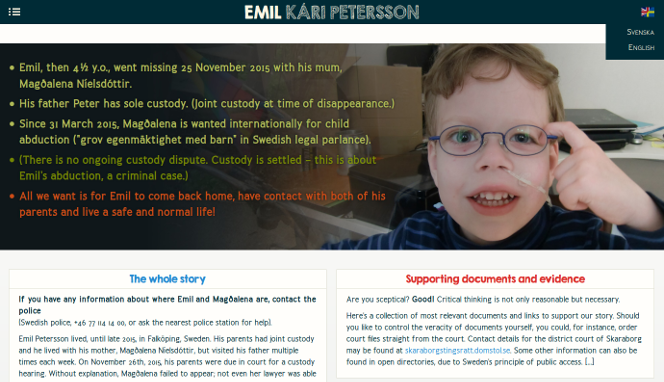 The site uses a percent-based Masonry grid for the desktop layout and a colour scheme based on Solarized. 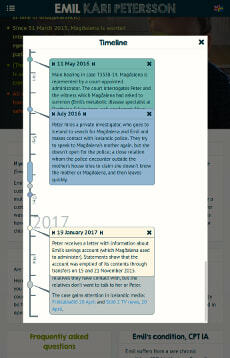 There's a custom timeline script and content is parsed from Markdown for simplicity. 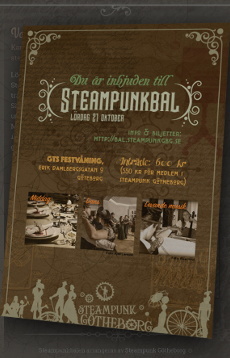 Flyers and posters were also printed, getting the case some attention in the media. This is one of those sites you'd prefer wasn't needed at all, but for now, it remains live. 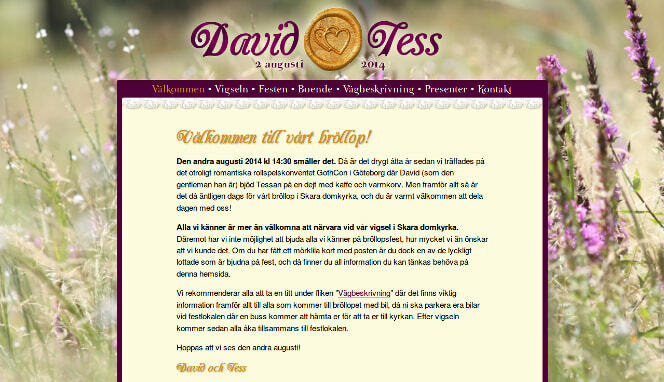 David and Tess got married on 2 August 2014. 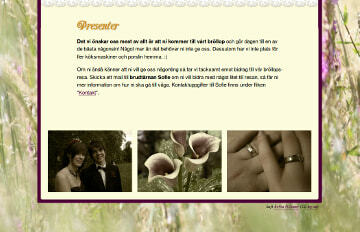 The design of the web site (a wedding gift to the couple) matches the wedding invitations and decorations and helps the wedding guests find their way to and around the big day. The photos at the bottom are semi-random—there's always at least one picture of the couple themselves and one of the engagement rings. The lace border, the two-hearts seal and the colours purple and gold were requested specifically by the couple. 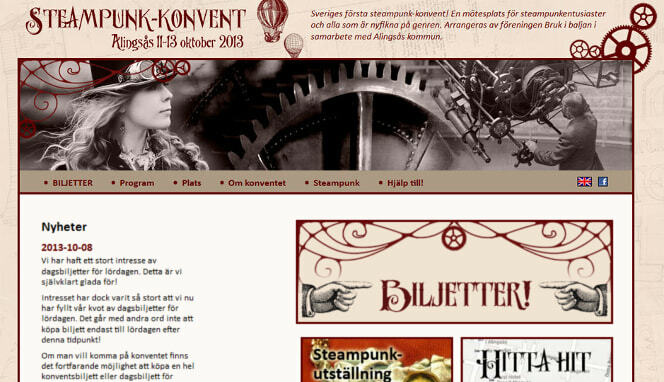 A re-design of the web site for Sweden's first Steampunk convention, making the site much more appealing and easy to use as well as mobile-friendly. The site retained some graphics from an earlier version, but the layout and most styling and photographic elements—which were based around public-domain images of pieces of engineering and old blueprints, to match the philosophy and aesthetic of steampunk—were new. 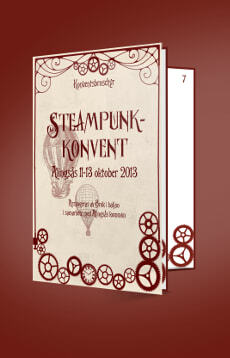 I also designed a convention booklet and some other print materials in a similar style. 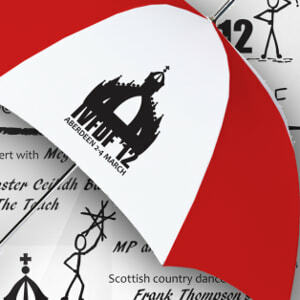 A complete visual identity—based on the King's College crown, a symbol for the University of Aberdeen, and the dancing stick-men drawn by a fellow member of the planning committee—and all printed material, from posters and booklets to umbrellas and wristbands, for the Inter-Varsity Folk Dance Festival when it came to Aberdeen, Scotland, for the first time. 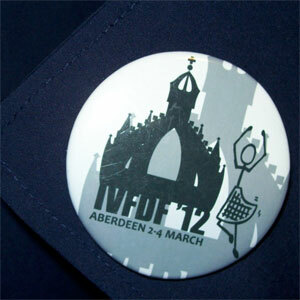 IVFDF is a weekend-long festival arranged at a different British university each year. 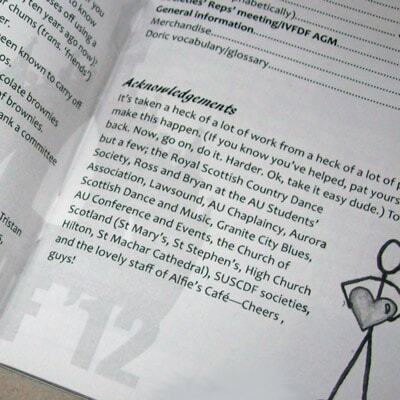 A challenge for 2012 was to make the festival look more exciting than ever so as to motivate the southern contingent to travel all the way up north—so the slogan ended up being "It's closer than you think!" and we took every chance to point out the friendliness (and perhaps silliness) of the planning crew and this particular festival. 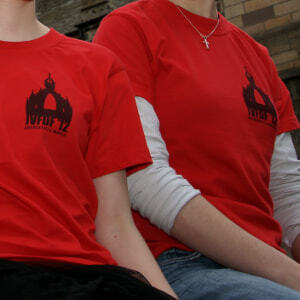 A web development and design outfit run as a Young Enterprise business, Paragon Design UF earned a ‘Best web site of the year’ award from the regional YE office for the clear and attractive way in which our web site communicated the business’s concept and ideas. 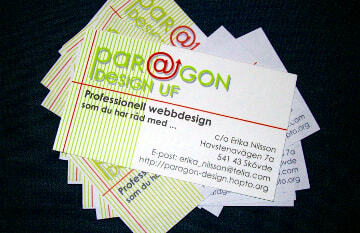 I was the head designer for the project and also developed Paragon Design's brand identity—the cute upwards-pointing @-sign of the logo symbolising constant improvement, and the "sidebar" of green and red lines tying the brand together. 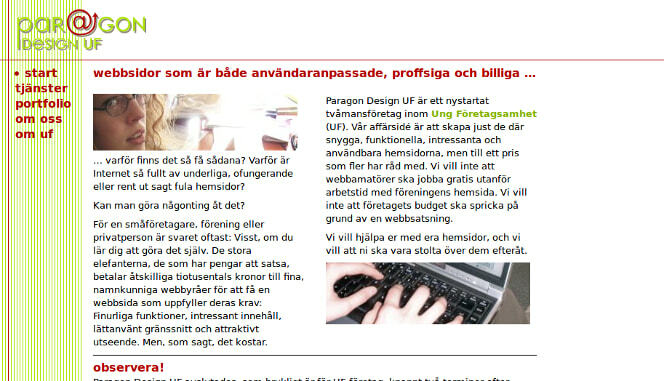 The site was fixed-width, because this was 2004 and the term 'responsive design' wasn't invented.